Shares of eBay Inc (NASDAQ:EBAY) fell sharply last week after the company’s latest quarterly earnings report failed to impress investors, and growth concerns are keeping investors from allocating fresh capital to the stock. Through the lens of technical analysis, eBay stock last week left behind what we call a bearish outside reversal candle, which as the name indicates should point the stock to lower levels. As I always highlight in particular during earnings season in this here column, a stock’s reaction to the news is more important than the news itself. Another way of putting this is that price is the ultimate arbiter for traders investors. 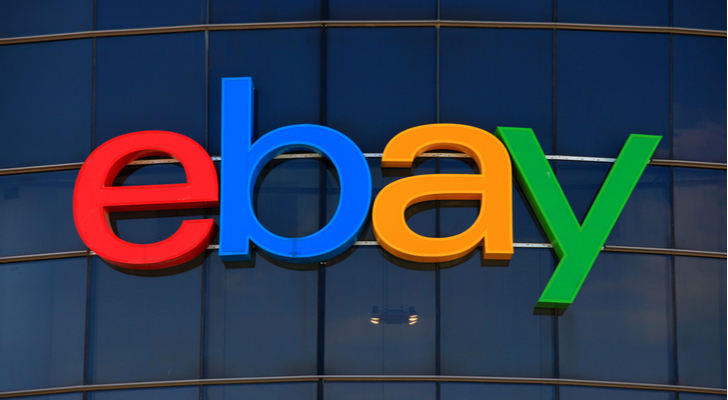 Concerns over growth prospects at eBay have been around for some time, although looking at the stock price which pushed to fresh highs as recently as early February, one could have easily been fooled. Keeping in mind that correlation among stocks in particular within any given sector and industry group is high, it should not be surprising to have seen EBAY stock rally to new all-time highs in late January/early February along with other technology-related stocks. Note that this rally in the stock also pushed it above the longer-standing up-trend. From a momentum perspective as measured by the MACD momentum oscillator at the bottom of the chart, the stock also became notably overbought, as its readings matched the overbought levels previously seen in September 2016, which then led the stock to correct. With last week’s “bearish reversal,” EBAY stock now sits at a confluence area of technical support made up of a simple support line (lower dotted line) as well as the yellow 50-week simple moving average. As we will see on the daily chart however, this area of support could easily break soon and see the stock slip plenty further to the downside. On the daily chart, we see that EBAY stock has been forming a series of lower highs ever since topping out in early February. After last week’s earnings report, the stock gapped down and fell notably on April 26 — and so far has not been able to recover. The support levels on the daily chart are the black support line as well as the red 200-day simple moving average. The way I see this, the second lower high that EBAY stock formed in mid April, followed by last week’s post-earnings gap-down, does not bode well for the stock. While the stock certainly could bounce and back and fill somewhat around current levels, I see this as an opportunity to leg into new swing trade short positions around the $38-$39 area with a downside target in the mid $30’s while any strong one-day bullish reversal could serve as a stop-loss trigger. Check out Serges Daily Market Outlook for April 30. Article printed from InvestorPlace Media, https://investorplace.com/2018/04/trade-day-ebay-inc-ebay-stock-short/.